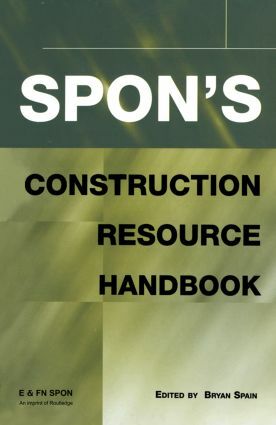 Spon's Construction Resource Handbook is the first book to present critical information about materials, labour and plant constants required for the estimating process under one cover. It covers all areas of the construction industry and will provide all those involved in the preparation of tenders, cost estimates and first-stage estimates with the information they need to work with greater confidence and prepare more accurate estimates and tenders. With a unique style of presentation, it includes thousands of item descriptions and a comprehensive collection of data, including labour and plant outputs, materials, elemental breakdowns and lists of relevant organizations. Up-to-date and comprehensive, Spon's Construction Resource Handbook will be an indispensable reference for estimators, quantity surveyors, engineers and architects working in local government and professional practices, government agencies, and contractors in all fields of construction. It will provide an invaluable reference base for negotiation of new rates where variations occur on a contract. Preface. Introduction. Building. Civil Engineering. Landscaping. Mechanical work. Electrical Work. General Information. Index. Bryan Spain is a consultant quantity surveyor who specialises in building and civil engineering costs. He has worked in local government, private practice and contracting organisations. He has also written over 50 books, mainly on construction costs.